The Three Magi, or Drei Könige as they are called here in Germany, were my favourite characters in the Christmas tale when I was a kid: their names seemed so foreign and exotic and hey: they followed a star and ended up being the first ones to visit baby Jesus and brought him gold and other stuff that I didn't even understand. Couldn't get any more magical than that for my taste. My best memories of the Christmas season were from the times when my parents took us to the Canary Island of Fuerteventura. Not only could we spent the days playing naked on the beach while everyone back home was freezing, but also Christmas itself was very different: We just celebrated it in our small family circle without having to fulfill any grandparents', aunts' and uncles' expectations, no boring church visits, no carols we had to sing, and so on. I was looking forward to Epiphany during those holidays, because that's when the local Spanish kids received their presents delivered by the Three Magi. The Magi would come riding into town on real camels, tossing candies to the children awaiting them in awe and escorted by police cars playing "Feliz Navidad" from their megaphones! Anyway, ever since I found myself on this magical journey I had rediscovered my interest in the Three Kings and had consecrated a piece of chalk on the last two annual Epiphany days to mark our house's door with the C + M + B initials for protection. Last year I was very excited to find out that Dr. Al Cummins has written a whole book on the Three Magi that also includes some practical chapters about devotional and magical items to make. Of course I had to have it...and gifted the book to myself as a Christmas present. This last Epiphany I found myself working all day on producing Three Kings Oil, Three Kings Chalk, and a protective talisman, as described in Al's book . The most fascinating item for me covered in the book is a seal from the Folger Manuscript Vb.26 (aka. "Book of Oberon", pg. 372 ) that features the Three Magi's names and a SATOR square. The original manuscript's talisman description reads: "to be delivered from all fear, and against shot to be further off". In his book Dr. Al proposed it to also be used as a kind of magic circle or plate for objects to be consecrated in the Three Kings names . Having never heard of a connection between the Three Magi and the SATOR square, I did a bit of research and found some intriguing bits of information: in a group of Byzantine churches from 900 CE in Cappadocia, mural decorations name the shepherds who came to adore the Christ-child as Sator, Arepo, Teneton, in another one Peratoras . According to a Byzantine bible of an earlier period  and also as reported by 16th century philologist Isaac Casaubon, the names Ator, Sator, and Peratoras were supposedly the names of the Three Magi . 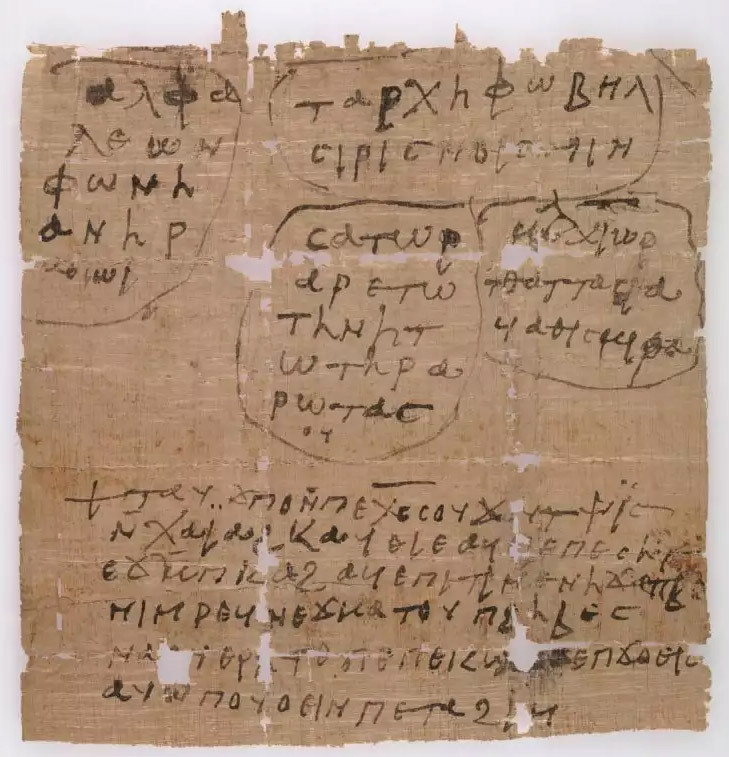 Of course their alleged names have been many throughout the ages depending on who you asked: Apellus, Amerus, Damascus; Megalath, Galgalath, Saracin; Dionysius, Rusticus, Eleutherius; Enoch, Elijah, Melchidezek; Hôrmîzdah, Îzgarad, Perôzâdh; Bathezora, Melchior, Thaddias; and many more . As we know, the ones that have prevailed in the West were: Caspar, Melchior, and Balthasar. 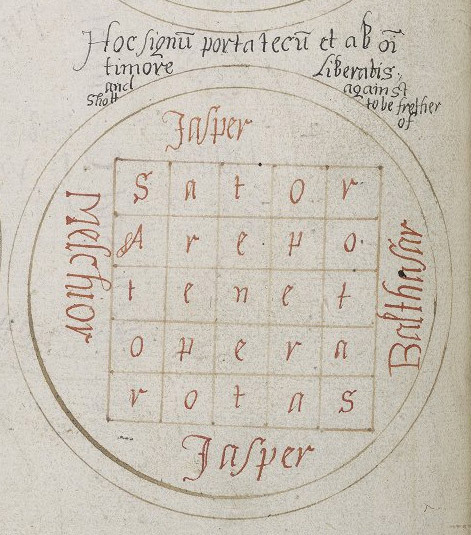 Nevertheless I had found a promising connection to the SATOR square. The accompanying consecration ritual Dr. Al proposes includes burning three candles with the Magi's names carved into them and sprinkling circles of rue and hyssop around the square . I could not obtain any rue on the days before Epiphany and because I wanted it to be more "Middle Eastern" - to suit the papyrus vibe - I diverged from that, skipped the herbs and candles completely and went "full Egyptian" by burning incense instead: As a representation of the Three Magi I arranged three sticks of incense (Frankincense, Myrrh, Aloeswood) in a triangle formation in a bowl of Natron which I placed in front of a thick white candle, representing the star / Christ. I recited Psalm 72, Matthew 2:1-12, Psalms 51 and 22. The consecration of my Epiphany materia magica went really well and felt quite powerful. 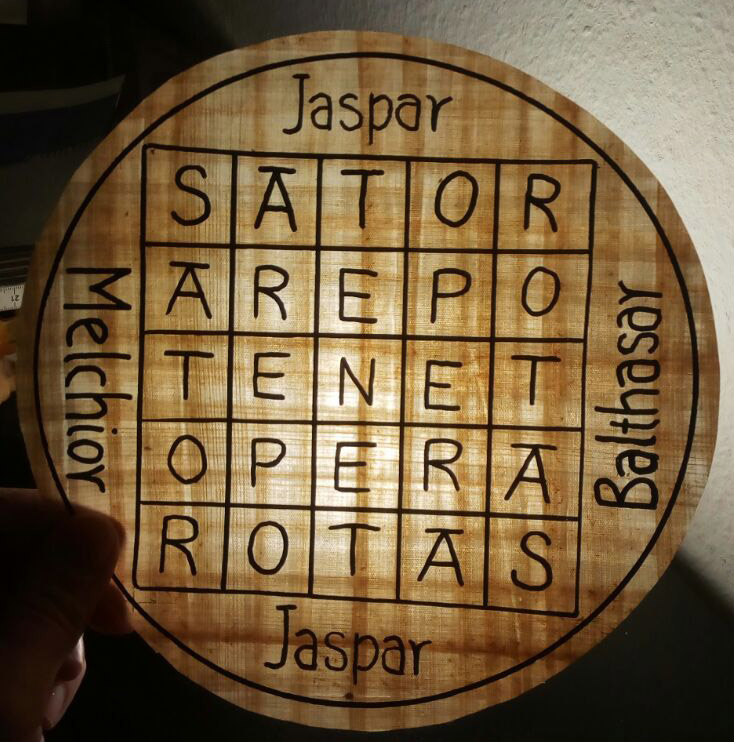 Because it was also New Moon I did my monthly Stele of Jeu operation right after that, but with the slight variation of adding "Hear me and turn away this restraining spirit, in the names of Caspar Melchior and Balthasar" to the exorcism part. I had been a bit wary about even doing the Headless Rite because this New Moon was also a Solar Eclipse and the Sun conjunct Saturn, but after the whole day dedicated to the Three Magi I felt quite protected and empowered enough to do it anyways (the talisman that "delivered from fear"?). Also, Epiphany coincided with the sun entering the headless / disk-headed Decan Kenmu, - a powerful synchronicity to the Eclipse near the headless south-node Ketu - it felt like the most auspicious headlessness moment, so I felt compelled to do it whatever it takes...also because of a powerful synchronicity that happened a few days before. "+ Christ was born on the 29th of Khoiak. He came down upon the earth, and he rebuked all of the venomous crawling things. Your word is the lamp of my feet, oh Lord, and the light of my way." Coincidence or not, I was left with the feeling that this was a confirmation of yesterday's work! German translation: Ich flehe Euch an, Caspar, Melchior und Balthasar, gekrönte Könige, die sich zu Jesus begaben, als er von der Jungfrau Maria geboren wurde, bei der Süße, die Ihr ihm gegenüber empfandet, als Ihr ihn aufsuchtet, und bei Eurer Freude, als Ihr ihn fandet und ihm Eure Gaben darbrachtet, mir Rat zu geben hinsichtlich dem, was ich Euch frage, genauso wie Gott Euch anhört und Eure Gaben annahm. Wahrer Gott, wie Du ihre Gaben entgegennahmst, so mögst Du heute mein Gebet ob ihrer Liebe annehmen. Und wie ihnen der Stern im Osten erschien, der sie zu Dir an den Ort führte, nach dem sie sich so sehr sehnten, genau so erfülle mir, Herr Gott, auch mein Verlangen nach Fröhlichkeit und Wonne. Gewähre mir, dass ich bekommen und erblicken werde, was mein Herz begehrt, beim Lob Gottes und meiner heiligen Jungfrau Maria.